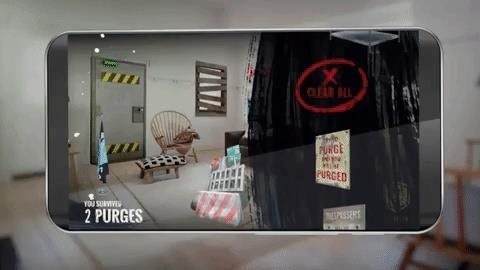 Have you ever wondered what it would be like to try to survive The Purge as depicted in the popular movie series? Well, thanks to Augmented Reality you can do that. 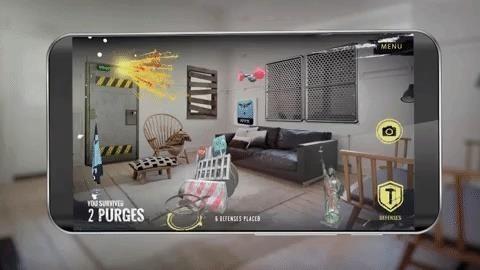 The app uses horizontal and vertical surface detection in current versions of ARKit and ARCore to scan the users' environment and allow them to place objects, Fearing the people who fear their lives to barricade their homes from virtual anarchists. Once the defenses are set up, users endure attacks from intruders unnoticed. If the obstacles stop, the survivors can continue to solidify their position with ever-stronger objects, while persistent waves of intruders are trying to get into the house. Augmented reality has become a popular marketing tactic for movie studios and TV channels, with sponsored experiences with Snapchat and Facebook AR promotions over the past year were on the agenda. For his TV shows, NBCUniversal seems happy with SyFy Happy! and Forensic Detective: Inside the Crime Scene for the Oxygen network, which serves as current examples of favoring stand-alone apps. It's a logical approach, bearing in mind that an app would likely fulfill the task of providing continuous promotion during a TV season, while an opening weekend push via Snapchat might work better than a one-time ad opening. Unity CEO John Riccitiello recently predicted that the first true mainstream app would likely come from marketing and advertising. Given the current speed of the network's AR production, there's a fair chance that this app will promote an NBC Universal TV show.